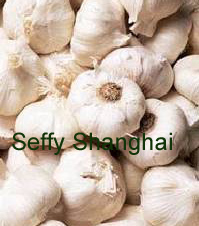 Garlic from China Shanghai , Garlic manufactory Shanghai Seffy Trading Co., Ltd.
Shanghai Seffy Trading Co., Ltd.
Garlic belongs to the lily family, which contains rich vitamin, protein, carbohydrate, inorganic salts and etc. People eat its bulb and bolt. It can be eaten together with rice or bread or used as condiment. Garlic can also function as a kind of bactericide. The suitable temperature for growing is 15~20ºC. Garlic bulb: big and white, moderate pungency, oblate shape. Garlic bolt: tender, no injury, of uniform size. Company Name : Shanghai Seffy Trading Co., Ltd.